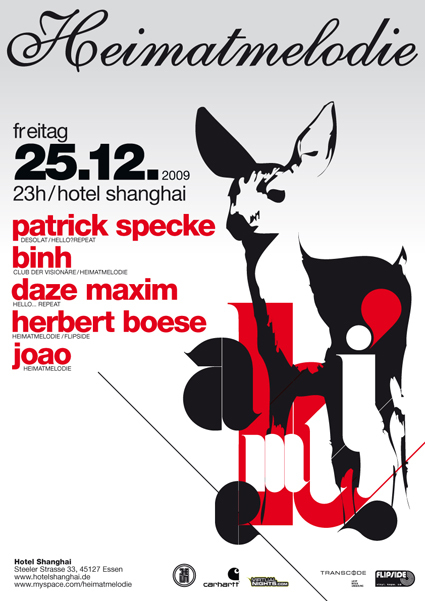 Here the Heimatmelodie folks invited some of the freshest contemporary House artists from the German Federal Land of North Rhine-Westphalia to play at their Xmas party. With Daze Maxime from Hello?Repeat Records Düsseldorfs most free thinking House producer plays live. Beside him his friend Patrick Specke, who released some acclaimed records on labels like Desolat or Kahlwild, will spin some uptempo music that features a kick drum on every beat. Furthermore the Heimatmelodie residents Binh, Herbert Boese, and Joao perfect the night with deep sets full of rhythms for moving your torso forward and backward in a rippling motion.